Small rural emergency departments are said to be not worth worrying about. They see too few patients. Is that really true? We decided to look at what was happening in our state of Victoria in Australia. The Australian Hospital Statistics 2012–13 reports that there are 621 hospital-based emergency care facilities of some size and sort in Australia. 204 are what has been traditionally thought of as emergency departments – in metropolitan and large regional centres. The Australasian College for Emergency Medicine accredits about 180 of these for training. 469 are smaller, mostly rural, facilities. I would love to describe the activity at these small rural facilities for you but, I can’t do it easily, because almost no data is collected from these 469 facilities. Large emergency departments submit episode level data on every patient they see – demographics, diagnosis, waiting times, disposition. Small emergency facilities often don’t have to submit anything but a count of how many people went through the door each year. So we decided to collect some episode level data. There is no point being a Centre for Rural Emergency Medicine if you don’t even know what is going on. We created the SHED project – the Small Hospital ED project. We aimed to collect full episode level data from six small rual emergency departments. It wasn’t as easy as we expected. Some were still writing patient names in big old books. We put an emergency department IT system at each hospital, we took all the nurses through triage training, we educated the staff, we employed research assistants for over 12 months at each site, we audited about 10% of the patient notes. The project ran from Feb 2011 until Jan 2012 and collected full episode level data from over 20,000 patients. We then expanded the project with the help of the Activity Based Funding Project at the Victorian Department of Health. We ran all our research queries through the data for all larger Victorian Emergency Departments over the same time, and we obtained the simple counts of patients presenting to Victoria’s other small rural emergency facilities over the same period. We think Victoria is a good state to study for this project as it is a small and fairly urban and centralised state. It is unlikely to exagerate the importance of rural hospitals. So could we answer the thought that there are not many small hospital emergency facilities and they don’t see many patients.? We think we have something to add. This is Victoria’s public emergency system represented with each icon scaled to the average number of emergency presentations seen in each class. 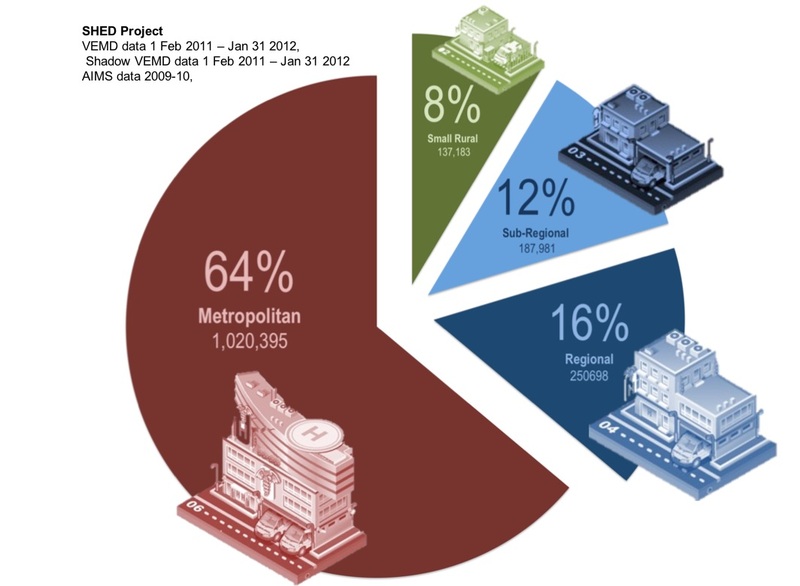 It is certainly true that metropolitan hospitals are bigger. They see on average 46,000 presentations each year (some are much bigger), and large regional hospitals average 42,000. 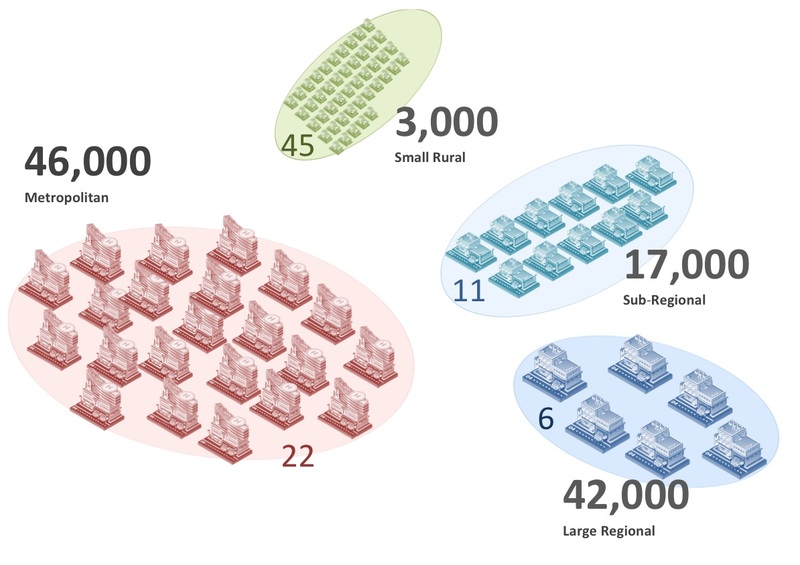 Subregional hospitals see 17,000 and small rural hospitals 3,000. You will notice though, that the number of hospitals goes the other way. There are 22 metropolitan emergency facilities compared to 62 rural emergency facilities- 45 of them are at small rural hospitals. So can we multiply things to see where patients are seen? Yes we can. Over a third of emergency department presentations in an urban state like Victoria are to a rural, regional, or remote emergency facility; one million metro, half a million rural. That means there are almost half as many reasons for Australasian College for Emergency Medicine to be a rurally-based college with a metro committee as a metro-based college with a rural, regional and remote committee. And even the smallest emergency facilities, like some of those I work at, see 8% of the total presentations, or 140,000 per year. That means that the sector sees many more presentations Victoria’s largest single emergency department ED. When combined, at least in the number of presentations, small rural emergency facilities are big enough to be important. This entry was posted in Hot topics and tagged Emergency Department, Rural, Rural and urban differences, Small Hospitals Emergency Database by crem. Bookmark the permalink.